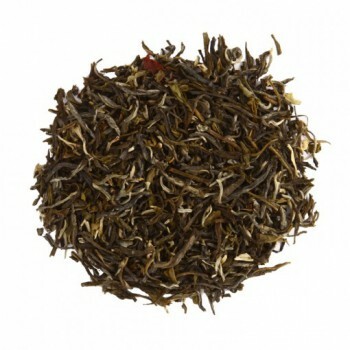 A pleasant, slightly sweet, delicate tea, reminiscent of apricot with a floral fragrance. The tea has a long aftertaste and clears the mouth. Even if this tea is strong, the taste remains fine. The color of the tea remains light. The China White Monkey is a white tea from China. This tea is produced at the Qingshan plantation in Fujian province. This province has a warm and temperate climate with a lot of rain, even in the driest month. The name China White Monkey derives from the fluffy, curled leaves which resemble the legs of the Chinese white monkey. A white tea is an unfermented tea. As soon as the first buds start growing in early spring, they are immediately picked. Sunlight and temperature affect the character of the tea. For example, a late harvest can give a very different tea than an early harvest. After picking, the leaves are spread out to allow them to dry in the open air. This is called fading. After this process the leaves are steamed and ground. Finally, the leaves still have to dry.